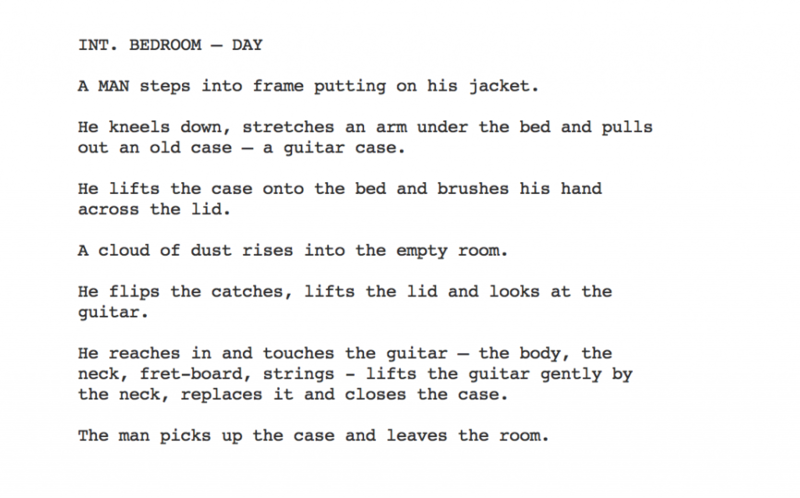 Project brief: Make two films of the same subject of your own choice, narrative or conceptual. Make a third film – an edit that combines the two and emphasises variations between FAST and SLOW. Look for a pattern of accents that works dramatically. The two opposite ideas of fast and slow are related to pace and rhythm, the speed at which the scene unfolds. Thinking of the ‘Slow’ film as a portrait of a character, I looked back at how Joanna Hogg drew her inspiration from paintings by Vilhelm Hammershoi. 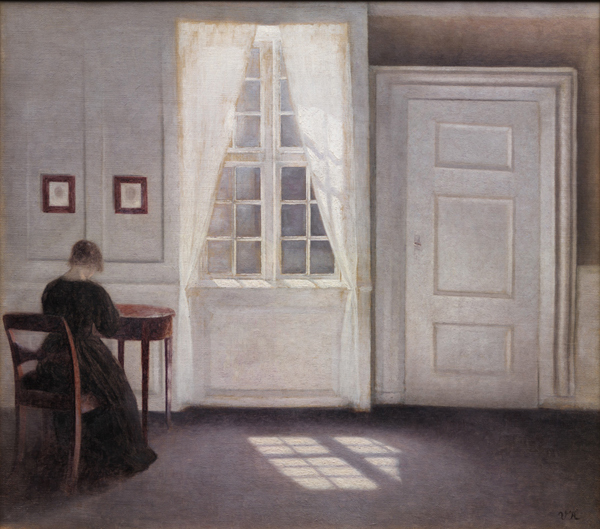 One painting in particular by Hammershoi caught my attention. ‘Interior in Strandgade, Sunlight on the Floor’ (1901). What I liked about this picture was the artist’s use of a limited colour palette made up predominantly of whites and light greys, and the way in which the figure is placed to one side of the frame with her back to the viewer. Looking back at Archipelago, I noticed one scene in which Hogg clearly drew upon Hammershoi’s paintings. I liked the way we are outside the room looking in at the character sitting on the edge of the bed. Like Hammershoi, Hogg uses a limited colour palette of muted tones. The character is placed to one side of the frame is dressed in dark clothes, similar to that of the woman in the painting. Hogg uses a static camera to capture the scene in a single long take, consisting of a single wide shot with no close ups or cutaways. The effect is that it allows the viewer to look at the frame in much the same way they would a painting. A similar technique is used by Roy Anderson to striking effect in his film A Pigeon Sat on a Branch Reflecting on Existence (2014). I have drawn upon both the composition and colour palette of Hammershoi’s and Hogg’s images in my film. I decided to use a very simple narrative: someone puts on a jacket then pulls a case out from under the bed, opens the lid, checks the contents, closes the case and leaves the room. One of my aims in this film was to use as few shots as possible. So I decided to create this moving image out of three shots: a master shot and two covering shots. I composed the master shot using elements from both Hammershoi’s painting and the scene from Archipelago in which we are on the landing looking into the bedroom. I did this by controlling the colour palette within the mise-en-scene and removing anything in the bedroom that would distract the viewer’s eye, such as pictures on the walls and other large or brightly coloured objects within the room. 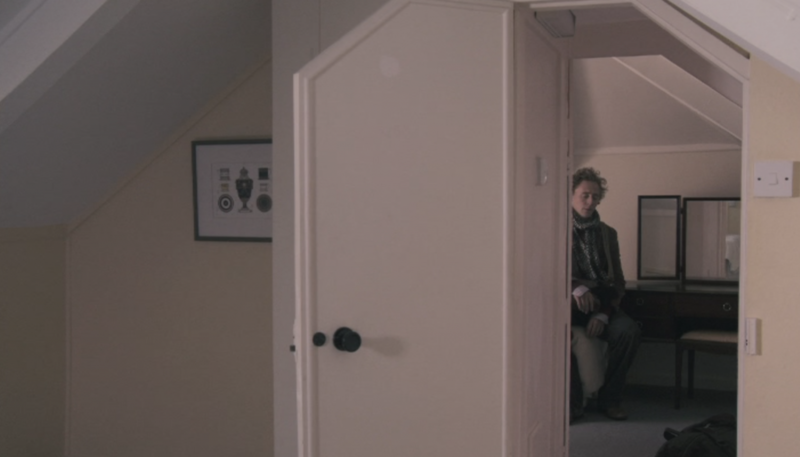 I then composed the shot so as to place the bedroom door in the right half of the frame, enabling me to place the character with his back to the viewer roughly in line with the right vertical third, similar to that of Hammershoi’s painting. When editing this film, I was looking for a way of using beat, pattern and tempo to help express a sense of slowness. Cutting the shots in a way that brings the viewer from outside the room into the room and back out again. The result is a slowly paced film lasting approximately a minute and a quarter, built around a series of static shots in which the viewer watches the action unfold within the frame. The ‘Fast’ version moves at a very different pace. As I was looking for a way of expressing the same idea through a fast paced sequence of images that echoed in some way the narrative set out in the first film, I decided to keep things simple and concise by filming and editing a series of images showing the guitar being taken out of its case, the amplifier switched on and the strings being tuned. In each shot I was looking for the key moment, movement or sound that defined that action. As a teenager I would turn the volume off, pluck a note and then slowly fade the volume up again to create a strangely ethereal tone. While filming the shots of myself tuning the guitar I started to play with different ways of making musical sounds using a single string and the controls on the guitar, and without realising it, I absentmindedly played with the volume control while plucking individual strings. It was only when I began editing the shots together I realised the musical tones I had captured could be used as an additional layer of sound beneath the natural sounds within the sequence. The shots fall roughly into four groups: opening the case; switching on the amplifier; emptying the case; and tuning the guitar. When editing this film, I was looking for a way of using beat, pattern and tempo to help express a sense of fastness. I did this by cutting each clip on the beginning of the action and letting it run for a second or two. Creating a moving image with a logical sequence of events. However, although the sequence of shots do move forward at a quick pace, I am not happy with the finished film. I think the images are too generic. They are neither narrative nor conceptual. They illustrate a very simple process rather than inspire a mood or feeling, or trigger an idea. One solution might be to shoot the images handheld, which would give the sense of a live performance. Another solution might be to include more of the character, giving a sense that this is about a person rather than generic shots of objects. Editing this version was like solving a puzzle. Taking elements from the previous two versions required considerably more thought than I had imagined it would. It was not simply a case of inserting the ‘fast’ shots into the ‘slow’ film. Working with my original script, I decided to use the sequence of shots from the first version as the main spine of the film. I decided on this for two reasons: First, because this would give the film the sense of a narrative; and second, because the long static shots would establish the overall feel inspired by Hammershoi’s painting that I was looking for in the film. The challenge was in finding the right point at which to insert the ‘fast’ shots. I was aiming for an overall flow that felt natural and not too contrived. The musical tones serve an important function within this version. Oddly, and quite unexpectedly, these ethereal tones act like a sound motif, complementing the visual imagery and drawing our attention to the fact that the guitar is a string instrument. They evoke the light, airy sound of an aeolian harp. They also create the sense of something breathing. Murch, W. (2001) In The Blink of an Eye: A perspective on film editing, second edition. 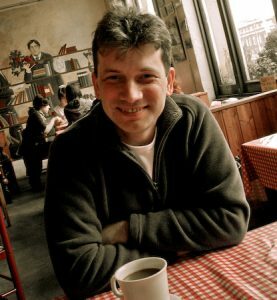 Silman-James Press.